This metaphor of “routes” is in line with Garcia’s comparison of multilingualism to a banyan tree in Southeast Asia that “needs to be recognized for its interconnectivity and multiplicity, grounded not only vertically, but also horizontally” (2009, p. 143). Repertoires change all the time because the lives of the persons who use them change all the time as well (Blommaert and Backus 2011). In this light, Blommaert et al. (2005) state that a shift is needed from a dichotomous model to a polycentric model in the way we look at language use in multicultural societies. Questionnaires in research and for purposes of policy development are often used dichotomously, with little attention to the linguistic reality, in which most individuals in society switch between varieties/languages depending on situational context, purpose, interlocutor, topic, and so on (Blommaert et al. 2005). We believe there are important indications which necessitate a critical reflection on the way we (try to) measure and capture language use. Dichotomous measurements do not do justice to the multilayered and multifaceted realities of the linguistic repertoires of groups and individuals. The use of a language other than the dominant one cannot be mapped accurately by using a yes/no question, as there are large differences in the amount of nondominant language that is used at home and its functions. At home, family members may mix their repertoires, and they may rely on multiple items in their repertoire, depending on the situation and the people they are having a conversation with (Branum-Martin et al. 2014; Brenneman et al. 2007; Duursma et al. 2007). The alternation, switching, and mixing of codes is also a reality that is mostly not considered when measuring linguistic repertoires dichotomously. In reality we observe translanguaging, a practice where pupils move flexibly within and between their linguistic resources (Slembrouck and Rosiers 2016). In sociolinguistic research, although useful as a social construct (Creese and Blackledge 2015), the separated view on languages that is more associated with code-switching has been abandoned, since it is not sufficient for the analysis of language use (Jørgens et al. 2011). The term translanguaging offers a lens through which the multilingual practices can be analyzed (Garcia and Wei 2014). Due to the complexity of language use, obtaining a representative picture is quite an endeavor. The aim of this study is to gain more insight into the language use of pupils, what does it look like in reality and how is it experienced by the pupils themselves? How can we try to capture the linguistic repertoires in a more refined manner than a dichotomous measurement does? In order to do so, we developed a language passport. Similarly to the language portraits used by Busch (2012) where pupils paint their languages in different colors on a body silhouette, such a language passport can be seen as an activity of language awareness. Language awareness refers to “the development in learners of an enhanced consciousness of and sensitivity to the forms and functions of language” (Carter 2003, p. 64). In activities of language awareness, the focus is on attitudes to languages and to raising consciousness that can improve language learning. The empirical research this paper is based on uses language passports as an activity to gain insight in the language use of multilingual pupils. The study of the language passports is done in combination with commentaries by pupils in focus groups. Pupils were stimulated to decide what they consider as a language (Busch 2012), to also involve, for example, dialects and secret languages. Thirty schools from three linguistically diverse regions (Brussels, Ghent, and Limburg) in Flanders (Belgium) participated in this study. In the selection of the schools, a number of elements were considered: percentage of nonnative pupils, elementary or secondary education, location, and type of education (grammar, technical, vocational). The focus group sessions were composed of 6–12 pupils per school, resulting in the participation of 100 pupils (53 in elementary (mean age 11.2) and 47 in secondary education (mean age 15.6), 52% girls and 48% boys). The aim of the focus groups was to gain insight into the linguistic repertoires and the dynamic and multileveled behaviors regarding language choice of multilingual pupils. During the focus group sessions, a language passport was constructed. The language passport is a written report structured as a mind map, which allows the pupils to present a clear overview of the languages in their repertoire. Figure 1 shows an example of such a language passport. Pupils were asked which languages they used, with whom, in which settings, for which topics, etc. The elements were color-coded (e.g., settings received the color red) to improve efficiency and reduce ambiguity. For instance, “school” often appeared in the language portraits as a setting as well as an association. Finally, the pupils were also asked in which language(s) certain elements of inner thought (Fishman 1965) were represented, such as dreaming, telling secrets, etc. The pupils received instruction sheets (see Appendix) allowing them to reflect and work individually first and ask the moderator clarifying questions. Afterward the elements of the language portraits were discussed in group. This helped pupils in adding elements they had overlooked in their portraits and created a group discussion which provided additional information. The discussions were recorded for later analysis. This visualization by means of language portraits helped pupils reflect on their ideas and perceptions. Both the visual and the oral reports were analyzed. The language passports were analyzed by entering them into MS Excel worksheets and using frequencies and pivot tables to observe trends and relations in the data. An important remark when analyzing and discussing qualitative data of this kind is that the absence of an element does not mean the negation of this element. The absence of the setting “home” in relation to Dutch on a language passport does not necessarily mean that the pupil does not speak Dutch at home; he/she might have forgotten to add this setting. The results of the language use as measured by the language passports are shown graphically using circles of different size and different colors (see Fig. 2). The oral recordings of the interviews/focus groups were analyzed using Nvivo11. An analysis of the recordings not only added important nuance to our understanding of the language passports, but it also provided detail on the pupils’ views on the languages in the school setting and their opinions on the quotations about multilingualism which were used as prompts. One of the first and most striking observations about the pupils’ language passports has been the number of languages they indicated as having mastered to a certain degree. In total 45 different languages were noted in all languages passports combined (100 pupils), including some “unofficial” or self-constructed languages spoken with their friends, such as bloementaal (flower language) and fantasietaal (fantasy/imaginary language). On average, pupils in both primary and secondary education reported speaking four languages. The language passports demonstrated that the pupils used the language of schooling most frequently of all with friends outside school. Pupils also spoke the language of schooling very frequently with siblings, more often than with mother or father. The overlap between family members was quite large, meaning that if the pupils spoke the language of schooling with one family member, they often also did so with another. Finally, the teacher and friends from school were also named as people with whom pupils interact in the language of schooling. Dutch was thus not only used with people from school but also to a great extent with people outside school such as parents and siblings. We found no gender differences in these results, that is, boys did not speak the language of schooling more or less frequently with any persons than girls or vice versa. The majority (84%) of pupils were born in Belgium but are second or third generation migrants. We did not find differences in results between pupils born in Belgium and those who were not, but this could be due to the small sample of pupils born outside of Belgium. In Fig. 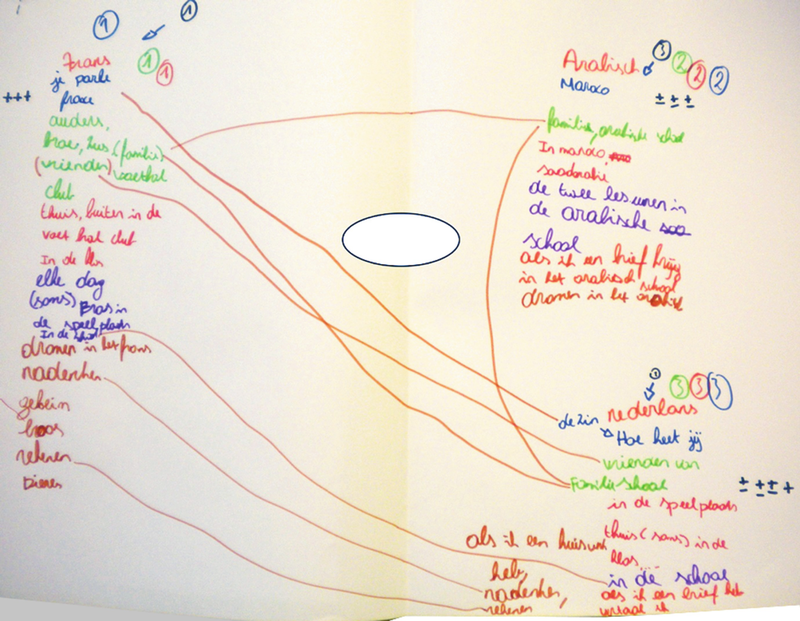 2, the use of the language of schooling by the pupils is illustrated with circles in different colors. 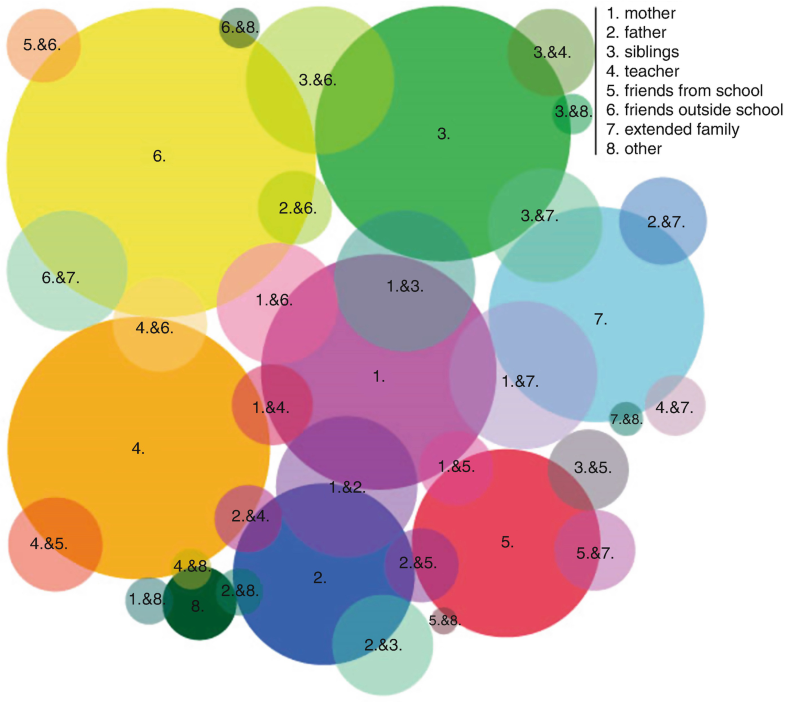 Each circle corresponds with a person (or a group of people), and the size of the circle represents the number of pupils who named this type of person as someone they spoke the language of schooling with. The opaque areas in the figure symbolize the overlap between two persons or groups, i.e., they show how many pupils indicated both on their passports. The language passports demonstrate how dynamically the pupils use their languages. The use of languages did not seem to be limited to one person, setting, or state of mind. Pupils often indicated that they spoke several languages with their parents, siblings, and friends and in different settings. The pupils also seemed to use different languages when communicating within their extended family, e.g., with nieces, uncles, and grandparents. Interestingly, these were not always the same as the language spoken at home. In some cases, the extended family had settled in another country, and the pupils used the language of this country (e.g., German) as a means of communication. The pupils were also asked how frequently they used these languages with these different persons. While other languages than the language of schooling were often used with parents and extended family members, the language of schooling seemed to be the language used most frequently with siblings. Switching, however, is very common. The language of schooling also often seems to be the language of choice with teachers and friends from and outside of school. Many pupils indicated during the focus groups that they often switched languages with discussion partners. It seemed to happen “automatically” when they did not know a word in one of their languages or just if that particular word was activated first. Another demonstration of their proficiency is that although they are multilingual, the language of schooling is an important component of their repertoire; they would rather speak a language other than the language of schooling. This is suggested in dichotomous measurements and how they report on what we have called different functions of languages. 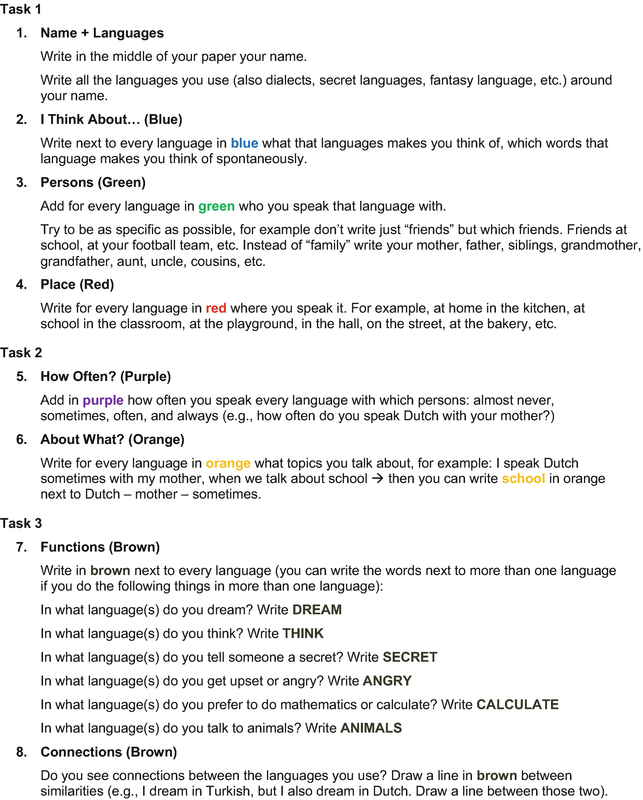 During the construction of the language passports, the interviewers asked the pupils to write down the use of a language by adding functional descriptions. The categories suggested were dreaming, thinking, telling secrets, getting angry, calculating, and talking to animals. The results are presented in Fig. 3. Dutch was used most often for calculating and thinking, which is not surprising, since Dutch is the language of schooling. “Emotional” or “other-worldly” functions such as dreaming, telling secrets, getting angry, and talking to animals, all which are done more often in other languages, even though the language of schooling continues to feature also in these areas. The analyses of the data showed gender differences with regard to the functions. For dreaming, the results for boys and girls were quite similar, although a higher percentage of girls tend to dream in their home language only, while boys dream in several languages. The same goes for calculating; both boys and girls prefer the language of schooling to do so, but a higher percentage of boys than girls also use other languages in combination with Dutch (Fig. 4). For getting angry and thinking (Fig. 5), it was the other way around, that is, a higher percentage of girls use different languages when they get upset, while most boys stick to their mother tongue. The largest gender differences were found for telling secrets and talking to animals (Fig. 6). For telling secrets, the majority of girls tend to use several languages, while boys stick to their home language more frequently. Both boys and girls prefer to talk in their mother tongues to animals, but more girls than boys use several languages, including Dutch. Eight of the pupils studied were native Dutch pupils (three in elementary and five in secondary education). Their language use was found to be more complex than strictly Dutch and perhaps French and English in a school setting. For example (see Fig. 7), a girl in secondary education was suspected by her teacher to be a monolingual pupil, but indicated in her language passport that she speaks “an East-Flemish dialect because she has many friends there.” Interesting is the description of this fact on her passport in that she uses some intermediate language (tussentaal) (Delarue 2011), “omdak” is a junction between “omdat” (because) and “ik” (the pronoun “I”). Another remarkable feature of this particular passport is that she indicates using Dutch, English, and a Flemish dialect, but when asked in which language she gets angry, she also indicates Italian. Pupils were asked to rank all the languages they use: in blue for the languages they prefer to speak, in green for the languages in order of preference for listening, in red to rank the languages according to preference for reading, and in black for writing. In the language passport in Fig. 8, this pupil in primary education illustrates that he prefers to speak, write, listen, and read in French. Of all three languages he uses, he ranked Dutch the lowest for all four language skills, except for writing. Writing he least prefers to do in Arabic. In general, reading and writing are preferably done in the language of schooling. In primary education, most pupils prefer speaking and listening in another language than the language of schooling. In secondary education we see the same tendencies, but the group of pupils preferring the language of schooling is bigger than the group preferring another language for listening. 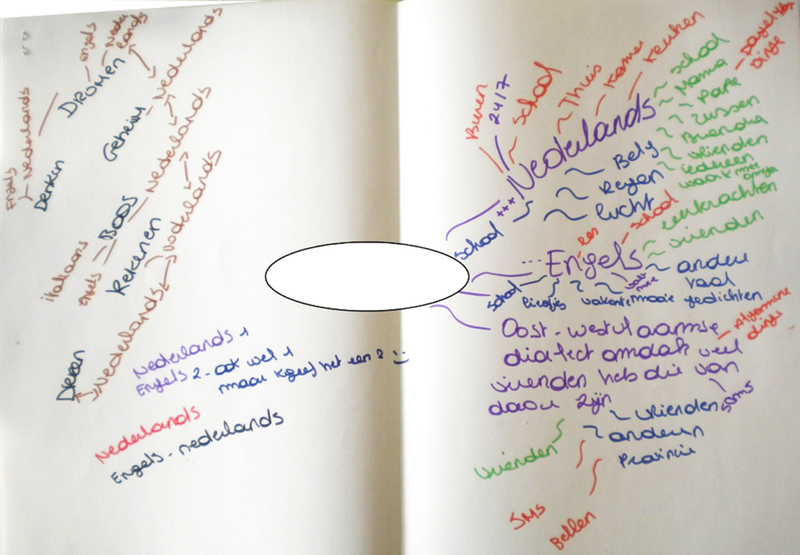 In secondary education, English becomes more popular than both Dutch and Turkish for listening. One challenge in obtaining a correct representation of the language use of multilingual pupils is that the underlying processes are often implicit and unconscious (Busch 2010). The language passports used in this research project have proven to be a useful means to begin capturing these complex (socio)linguistic realities. The passports demonstrate individual variability and overall complexity of pupils’ language resources. When considering alternative measures of home language use, the language passports have shown to provide an enormous amount of information on the pupils’ linguistic repertoires. The language passports used in this research confirm that the linguistic reality in which pupils’ function is more complex than is presupposed by a dichotomous measurement. The results of the study indicate pupils use many linguistic repertoires, including self-constructed languages and unofficial repertoires such as intermediate language or dialect. Pupils switch actively between languages, not only when moving between different interaction partners but also when communicating with one person. This dynamic use of their linguistic repertoires happens automatically and is most often unconscious, but in the discussions within the focus groups, the fear that this would be an impediment of their learning of the language of schooling was very apparent. One explanation is that pupils have incorporated this feeling from others, their teachers (Jordens 2016). We know from previous research that schools adopt a monolingual habitus (Gogolin 2002) and that monolingual beliefs of teachers are especially present in schools with a more balanced composition in terms of ethnicity (Pulinx et al. 2015). This study is an illustration of the fact that linguistic reality shows individual variation in the trajectories of persons, pupils switch between varieties/languages depending on situational context, interlocutor, topic (Blommaert et al. 2005), and, in this case, depending on the purpose. Not surprisingly, pupils mainly use the language of schooling for calculating and thinking, but when it comes to more emotional functions such as getting angry, dreaming, or telling secrets, the majority uses other linguistic repertoires than the language of schooling. Another interesting conclusion of this research is that native Flemish pupils are multilingual as well, despite them often being regarded as monolingual. This is in line with the findings of Canagarajah and Liyanage (2012) who also found so-called monolinguals to shift between different registers. These language passports are, therefore, an interesting activity for the entire class, not only for multilingual pupils. They can be used for multiple purposes. First, they can be helpful as a didactic tool, for several reasons. The passports demonstrate individual variability and overall complexity of pupils’ linguistic repertoire, they are an accessible and easily adaptable way to discuss multilingualism and multiculturalism in a classroom context, they provide both teachers and pupils with new insights into their (own) language use, and they are a way to invite/accept home languages in a school context, thereby improving the pupils’ sense of belonging. Second, the passports can be used as a tool to work on a multilingual policy since they give schools a greater understanding of their pupil population while enabling them to adjust their school policy and support for multilingual pupils. Third, the language passports could also be used as a research tool. 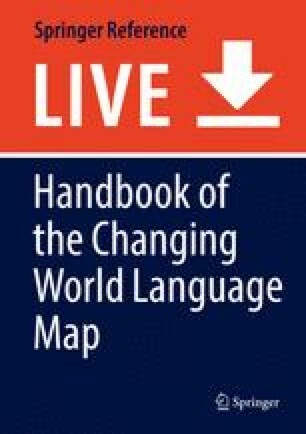 When considering alternative measures of home language use in this study, the language passports have shown to provide an enormous amount of information on the pupils’ linguistic repertoires, and they also open questions and can provide new insights and inspire future research while at the same time being easily adaptable to the research’s needs. The language passports used in this study are a step in the direction of a more polycentric model as proposed by Blommaert et al. (2005), but there is still a need for registrations of interactional dynamics that have more situational awareness. A limitation of this study is that it did not map the home environments of pupils by using observations. The language passports rely on what pupils reported themselves, and since the processes were often unconscious at first, observations in the family could complement this research. Moreover, it is a recommendation for future research to expand the knowledge on the quality of the interactions, which we did not explore in the present study. To conclude, we believe the language passports and the focus groups with pupils give more in depth insight into the reasoning behind pupils’ use of multiple languages with one interaction partner, in one setting, or even within their own minds depending on the function for which they are used.